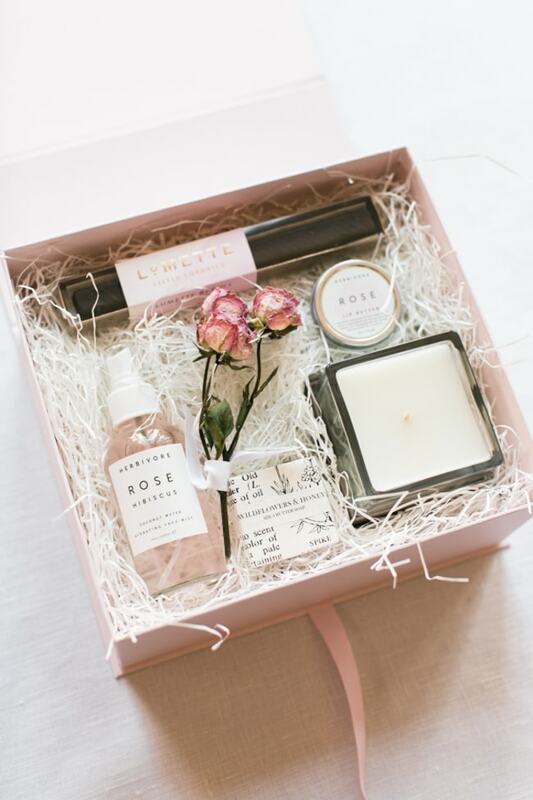 Nothing says “We’re ready to get this party started” than wedding welcome gifts for your guests. Whether you’ve invited out-of-towners or you’re hosting a destination wedding, these little treats can certainly kick things off and leave your guests speechless at your thoughtful gesture. Tying in the theme of your big day can really leave a lasting impression. If you’re greeting some special ladies, floral-inspired boxes are a dreamy way to welcome them. Lip balm, a candle, a piece of gourmet chocolate, and even dried flowers will make them instantly feel luxurious and pampered. Are you hosting a pre-wedding event like a low-key rehearsal dinner, barbeque, or even an evening filled with games and mingling? Help your guests out by offering them things to stay comfortable. 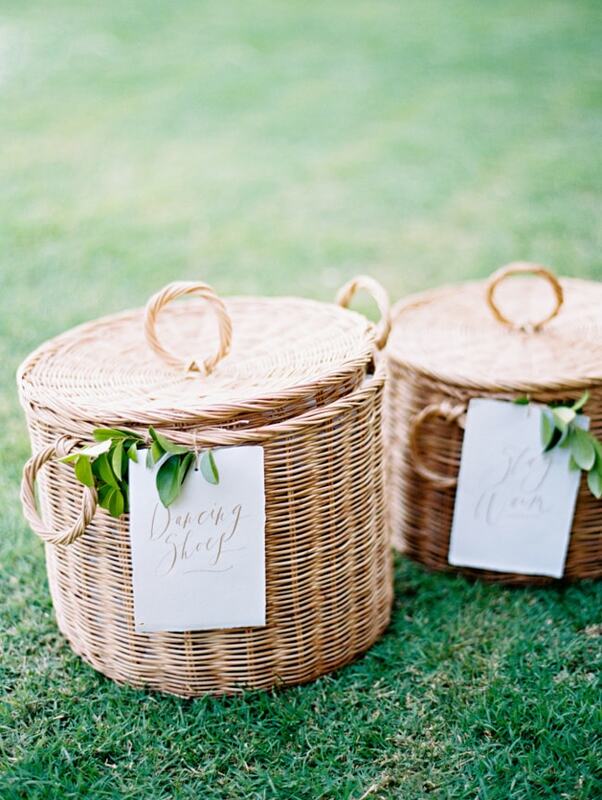 It could be as simple as flip-flops and pashminas but placing them in a nice wicker hamper adds a touch of elegance to a fun, outdoors event. Not only are the contents important but the presentation can have an impact, too. This darling fold-up cardboard box has the couple’s initial on it with a blue stripe. But once opened, guests are treated to all kinds of special things like local candies, chips, and tea, along with a fan to keep and koozie to keep things cool. Most importantly, they have a nice welcome letter from the couple. You can extend a theme into your welcome bag in a multitude of ways. This globe-trotting duo chose to have not only their bag designed with a global theme, but also a pair of flip-flops, too. They paired it nicely with other accompaniments to remind their guests what the wedding was all about. And if you want to take the personalization one step further, you can always monogram the welcome bags for your guests’ initials. This bag is monogrammed and tied with a special note. 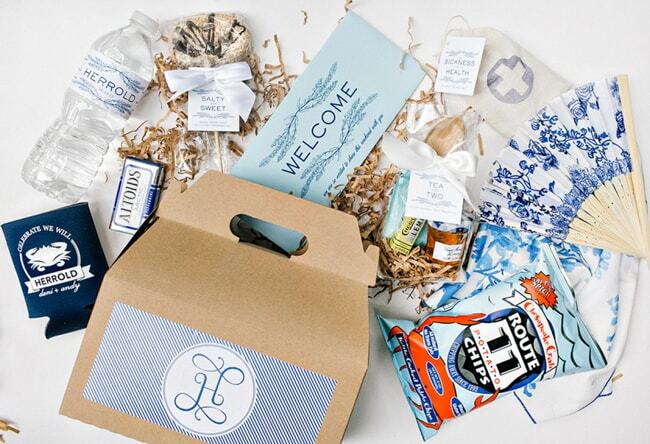 This kind of welcome bag is something your guest will want to keep long after the wedding day has passed. If you have guests traveling quite a distance to support you on your big day, make sure they know how much you appreciate them. Make their arrival comfortable with a welcome gift that offers treats and trinkets so they can start celebrating right away.